Pete Souza, the chief official White House photographer—a low-key genius who also gave us this one, and this one—has released his annual 2015 Year in Photographs, and I’m not trying to get all sentimental on you guys, but they are pretty great! In the gallery, which you can view in full here, we see Obama crawling on the ground with vast array of beautiful babies (something I will never stop wanting to see), sitting on tables while everyone stands around nervously, hugging his daughter at the Whitney, hugging Vice President Joe Biden at the funeral of his son Beau, getting spawned on by a salmon in Alaska, whistling in the sunset, and hanging out with various thrilled kids who might not get to see another non-white family in the White House for a long time. 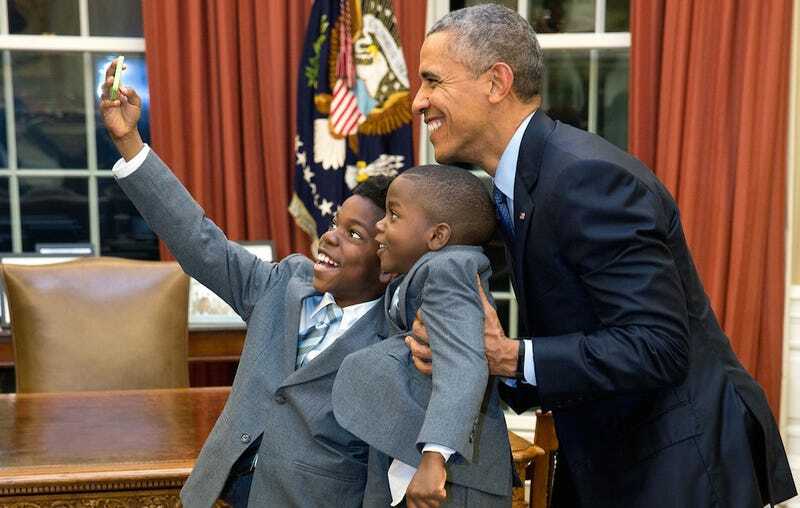 Image via Pete Souza/The White House.